The hunt for “alkaline water” is on these days, with kangen water filters costing upwards of $800! You don’t need to spend of money if you start your day with an alkaline drink made with lemons as a primary ingredient. Even though they taste acidic, lemons are alkaline when digested by the body. Water is also naturally alkaline. In fact, your tap water only becomes acidic picking up mineral residue from old pipes or from being chemically altered by drinking water additives. There are numerous health benefits to starting your day with room-temperature water, and lemons only add to that list of health benefits (aids in digestions, helps cleanse your liver, and so on). Recipe: 2 slices of organic lemon and 3 slices organic cucumber. Be sure to use purified water. 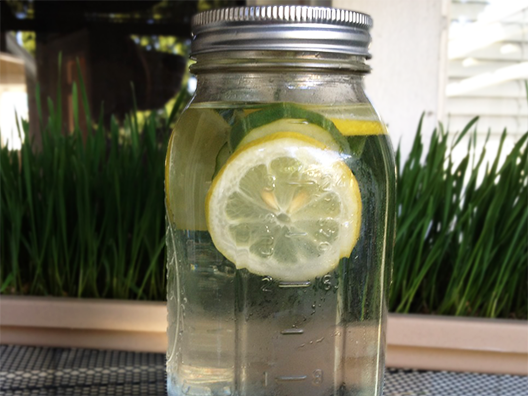 Leave the mixture out overnight night and drink the water when you first wake up – your body will thank you for it! how much amount of water should i use??? Did you see the picture with the article? Looks like a quart jar to me. I have a recipe for infused water.Can you tell me the health benefits of this water:6 cups filtered water, 1 Tbsp.grated ginger,1/3 cup mint leaves,1 lemon(or lime)sliced, 1 cucumber sliced. Let water infuse over night. Drink all the water the next day. how much will be the pH approx.?? All this is nonsense: Cucumber has a ph approximating 5.2-5.5 while lime has around 2.5…how do you expect that water to become alkaline. The blood pH is well regulated to a narrow range between 7.34-7.43…intake if thus water will not make it alkaline…further in excreting an acid load you lose precious alkali from your body too.! Doctorshave no clinical or nutritional training in medical school. This civilization is new and no nothing of past remedies. Drink up it’s good for you. Lemon juice in its natural state is acidic with a pH of about 2, but once metabolized in the body it actually becomes alkaline with a pH well above 7. The water will be acidic but as it is absorbed by the body it becomes alkaline. This is fairly commonly known science, so the author probably did not include this info as it is supposed to be known to one and all. Author did not anticipate people like you exist who may not know many things. Calling things you don’t know as nonsense is not a good way to learn anything in life. As a dental hygienist, I see so many people with acid erosion on their enamel and hypersensitivity to hot and cold. About half the time they are drinking acidic, infused waters. Although the body has the ability to convert said drinks, our mouths do not. would drinking with a straw help to prevent the tooth enamel from acid erosion? Correct, but you forgot about the water? Receipt is: cucumber, lemon (organic) + water. Why organic? Becouse lemon when is not organic contains a wax, whitch is not healtly. All the ingredients must be fresh and drinking at once.On the next day must make another composition whitch must be fresh. Organic because fertilizer and pesticides are not used. Wax is only used on the exterior skin by suppliers to make produce appear more appealing. Hie .. advise well taken; but not sure of the quality of lemons that are normally sold in the market (organic or not). But I donot think any harm in trying. Lets give a benefit of doubt.